Where a lot of us go wrong, me included, is we will produce content we will put all our effort in, we write stuff, we blog about something, we’ll make a video, we’ll do whatever. But then, we don’t tell anybody about it. 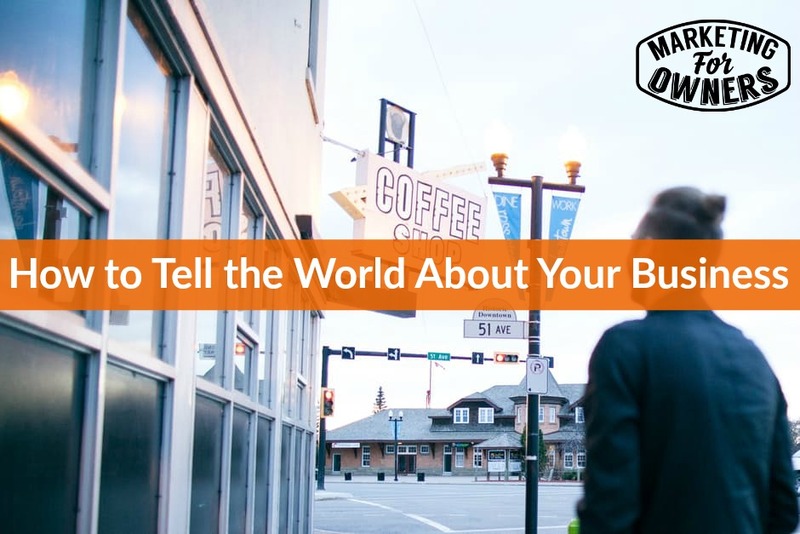 And this is the thing is, as I said at the start, it would be your dream for the world to know about your business. You can do that by creating information that people want to know about them. People crave. But even then you are not going to get very far unless you tell them. And this is, this is essential. Really essential. Otherwise you are wasting your time. Derek Halpern of Social Triggers once said he spends about 20% of his time creating content or products, and 80% of his time promoting the products or content. He promotes the content, so blogpost, videos, etc. as much as he does his products. That’s because the reason he creates that information, the content, is to eventually sell products. Do you get it? Do you follow? So why shouldn’t it have the same? You are going to put effort into all of it. Now, when, no matter what you do, you are doing it for a reason. And you’re good at it. Yes you are. You are an expert. Unless you just started yesterday, you are an expert. The people who are interested in what you do are the people who need your services. To them, the reason they need your services are because they are not experts. They don’t know how to do it. That’s why they need you. When you want your TV repaired, if anyone has that anymore, you go to a TV repair shop, or person. They are an expert. You don’t question it. I assume they are an expert because they are an accountant, they are confident and they do my stuff. Then they back it up. So firstly get it into your head that you are an expert. And secondly decide how much has the world wants, you want to know about you and your business. You do not have to use the whole internet. So if you are a local fencing company for instance, this has come up before with my friend in Tumbrige. If you are a local fencing company, my friends, they have a distance of about 30 miles radius where they can deliver, so they deliver on their own trucks. Now we can say oh they can use carriers and stuff, but perhaps they install it. It honestly, fencing is big stuff. It’s very hard to get outside carriers to deliver big stuff in a clever way that gets there in one piece and caring. So lot of local companies just operate within their delivery distances. Now when you are on social media, and when you advertise, social media means twitter and things like that. When you advertise on Google AdWords, or if you do, you can actually set parameters, you can set the distance. You can set a radius, you can set postcodes, you can set town names, as to where you want your ads not to show or where you want them to show. You can exclude places. So for instance, if you cover the UK but you, but it’s expensive to ship to Northern Island, you can exclude Northern Island, or you could exclude islands and highlands from where you advertise, if that makes it too expensive to ship there. So if you were a local business. You can promote that way. Now how do you promote? Well firstly, promote. Secondly, social media. Social media, this is first one by the way. Social media is free. So why wouldn’t you use it? Now you do not have to be using every day. Using twitter, using Facebook, using LinkedIn, using Snapchat, or Pinterest, or Tumblr, or what have I missed, Instagram. You do not have to use them every day. But I strongly advise that you use twitter for promotion because twitter is the only one with a search facility. So you can find people, you can find prospects to talk to. You can find people who are searching for information about fencing, for example. And you can find them, who are searching in a certain radius. You can actually use that. If you are not sure how to, just google. It’s called geo. G-E-O. So just google the term twitter geo targeting. And there will be a full explanation from twitter or from others on how to set up. How to do it. That’s one. So you can find people who are talking about it, and then join the conversations, and then carefully, gently, eventually let them know what you do. But if you are Jo blog’s fencing, they’ll see it in the title and they’ll probably look up your website, and follow your profile. Use social media like that. Don’t promote your services on it, alright. Help people, help people in such a way, and then give them a reason to come to your sites, say you’ve got an article, say, ‘By the way I have an article about this @’, and send them the link, or a video about this at, and send them the link. You are the expert. So promote. And that’s one way to promote your article that you wrote about that, or your video. Do you see? Also if you have friends, if you have friends, just contact them and ask them to share it. Simple. What are they going to do? They are going to either share it or not share it. They are still your friends. Now obviously you are not going to ask them every day, you are not going to, if you are blogging 3 times a day, I wouldn’t do that. I wouldn’t recommend blogging 3 times a day. Unless you are the BBC or Huffington Post. But you ask friends, if you have a product, if you’re launching new product, tell your friends that you have got a new product. Friends, family. Ask them, phone them up. Speak to them one at a time. If you have to. Remember how much effort do you want?? How much do you want this? Do you want to succeed or do you want to be lazy, like everyone else? Do you think the successful people put some effort in? Yeah, I think so. No, you only heard about them once they were successful. Okay, remember you didn’t hear about all the effort. But pick up the phone, read their book, find out how much effort they put in. find out the hours. Most honest one about this is Gary Vaynerchuck. Gary Vaynerchuck very famous on social media, makes a fortune, but spent 20 years working 20 hours a day. Didn’t go out with his friends when he was young, he worked in the store, etc. If they are a company, say ‘Will you buy 10? Will you buy 100?’ If it’s a large company, he’ll say, ‘Will you buy a 1000 books?’ And there’s this reciprocation thing, people will. Now you’re going to think, ‘Oh I can’t do that.’ Why not? They are your friends and family. Alright. Why not? It’s up to you. How about a podcast? This is a podcast. So for example, on the 10th, we just opened The Owners Club gold. So go to the website at www.theownersclub.co and see what it’s all about. It’s a monthly thing, its 29 pounds a month. Remember all full transparency. That’s just opened. I am going to say right now, please join. Right, you have been listening to me. I have been producing content. There are thousands of you that listen to this all the time. This is a very very popular podcast. If you’ve listened to me this long, you know I can help you. Imagine what would happen when you get on a dedicated call with me. Imagine if you did that every couple of weeks. Imagine what I’m going to give you. You know I give stuff away. 29 pounds a month. It’s like $35. It’s nothing, or $40. It’s nothing. And if, I am going to be blunt. If you can’t afford that, maybe you shouldn’t get in business, because this is going to help you grow your business. If you can’t afford to invest that in growing your business, 29 pounds, you seriously should just stick with your job, and do not start a business. Yeah, no being blunt. If you want the free version, you can go to www.marketingforowners.com/join. There is a free level, but it will not get all of the goodies. Because I want to reward those who wish to try. And there you go, see example, podcast, used to ask my friends to buy my product. But you can produce videos, and you can again ask people to buy your product. Call to action. You can go on LinkedIn, can post on LinkedIn and at the end, have call to action to tell them to share this. To tell them to point out if they enjoyed this, tell everyone else who needs to know. Promote everything you do. Repurpose it. Use it again. Promote it, and then promote it again. If you wrote a good article 2 years ago, go and promote it again today. Tell people about it. Write evergreen stuff that doesn’t date. So it is Thursday. It is time for a drive time podcast. And today we are going back through the archive. Because the ones you should be listening to. It is for Pat Flynn of Smart Passive Income. 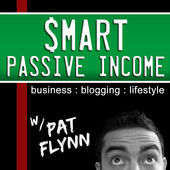 If you’ve not heard of Pat Flynn and Smart Passive Income, that’s it. Just look it up. Google it, go to iTunes. O by the way. Sorry, just before I go, David Bain tomorrow. Ones to watch podcast. You want to know anything about podcasting, he is on tomorrow. I’ll be back with a quick one on Monday.